Simple and free. The Log4OM ham logging program does the basics well and is worth considering. Most ham operators keep a permanent record of all their radio contacts. These records are called “logs”. My early logs are on paper, and since 2003, on computer. Logs are useful for keeping track of previous contacts and applying for awards. 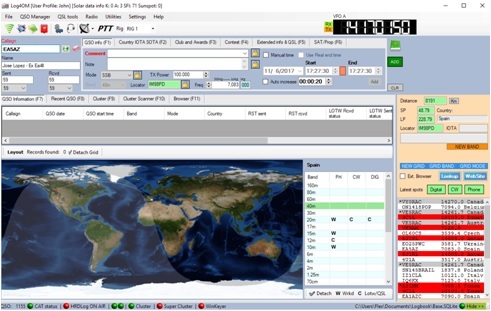 Modern logging software programs also connect to your radio and other related software. My original ham logging software was Ham Radio Deluxe. I worked great. However, a few years ago this free software went commercial under a subscription model. I dislike “renting” software so I looked for a free alternative. When I got my new Flex radio I switched to DX Lab Suite, as described previously. Now, while I have enormous respect for volunteers who contribute free programs to the community, I was continuously challenged by this suite of 8 separate programs. Although highly rated, I found I spent more time trying to configure this software than actually using it. The main challenge with DX Lab Suite is that is tries to do too much in too many separate modules. The amount of configuration options is staggering. It’s online documentation seems to go on forever. I am a fairly sophisticated software user, but I longed for something simpler. So, I installed the Log4OM ham logging program. Developed by an Italian ham – Daniele Pistollato, IW3HMH – Log4OM is a single, highly integrated program. It only took ten minutes to install, import my log, and get up and running. Well done, Daniele. Log4OM does not do as much as DX Lab Suite. But it does what I need and seems easy to configure. It controls my Flex 6300 through the popular OmniRig CAT module. It logs contacts and interfaces with popular services like Logbook of the World. Propagation and path information shows up easily. Same with DX Cluster connections. While not as sophisticated as HRD or DX Lab Suite, it does the basics really well. Documentation is great. I may try DX Lab Suite again one day, but in the meantime I would recommend Log4OM as a simpler alternative. If you are a ham looking for a easy logging solution, give it a try.